Just a quick post this morning…I’m still going through photos from a very productive long weekend! On Friday I went over to my parents’ house. 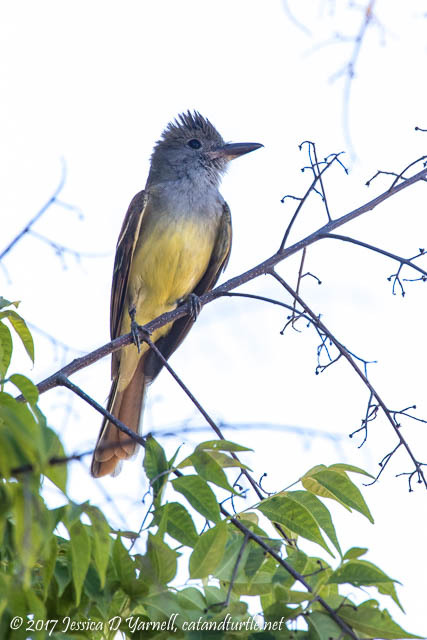 We heard the call of a Great-crested Flycatcher from a neighbor’s tree, so I grabbed my camera and went to investigate. He was sitting out in the open, perched nicely on a branch. Great-crested Flycatchers are common in Florida in the summer but I don’t get many chances to photograph them. What a nice bird! Loving your​ blog.. We were in Florida recently and visited the Florida Aquarium thinking we’d see fish, but we’re pleasantly surprised to see way more birds. I’d love to live in Florida and see all the beautiful birds your blog talks about. Daytona Beach is my favorite place.